The Scottish Government announced the news ahead of an A83 Taskforce meeting yesterday, which was convened to set out a plan for dealing with landslides at the Rest and Be Thankful. Last month the road closed for nine days when a series of landslips hit following heavy rain. 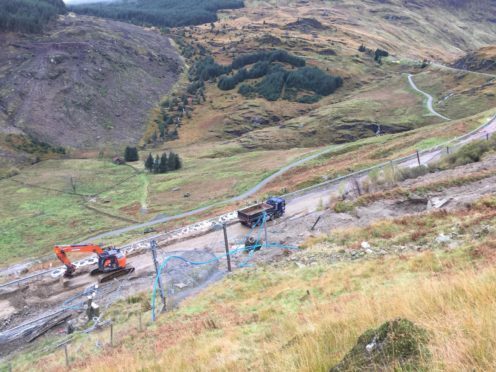 Landslip mitigation measures at the Rest are to be reviewed in a bid to further improve the resilience of the vital route in Argyll which runs between Tarbet and Campbeltown. Speaking ahead of the meeting, Cabinet Secretary for Transport, Infrastructure and Connectivity Michael Matheson said: “I am very aware of the importance of the A83 to this region. We have invested £69.8m in its maintenance since 2007, including £11m in landslip mitigation measures and improvements to the Old Military Road diversion route. “However, with the recent landslip still fresh in the memory, I’ve asked Transport Scotland officials to review the current programme of mitigation measures, with a view to further improving the resilience of the road, and report back to me in early 2019. “Argyll and Bute will also be prioritised in the second Strategic Transport Projects Review, meaning recommendations for the region can be among the first reported. It will consider the transport needs and priorities for the whole Argyll and Bute area.